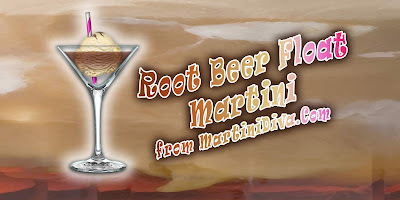 I have created many Ice Cream Cocktails and one of my favorites is the Root Beer Float! a step right back into the days of driving up to the A&W and having a car-hop bring you a frosty treat just bubbling away with creamy goodness. Yes, I know there are root beer infused vodkas out there but this was my original recipe and, frankly, it tastes just like a real root beer float, just with a bit of a kick - and you're not stuck with a whole bottle of vodka you can only use in one or two recipes.